Last time, Kara reunited with Z’ndr and Krypto, while the Circle, headed by Z’ndr’s adopted mother, put a hit on Supergirl. This issue switches between Kara and Z’ndr’s points of view, which is great because we get insight into what they’re both thinking and feeling in the midst of their budding relationship. I loved this issue because, for the most part, it was a break in the nonstop action we’ve been getting for the past few issues. 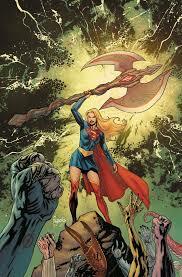 There’s time for Kara to reflect on all that’s happened, and the same goes for Z’ndr. Seeing the two bonding with Krypto was adorable. The art in this issue is incredible—I love the unique feel of a day at the beach on the Planet Tavaar and the contrast to the flashbacks throughout the issue. Questions that I know I had about Z’ndr’s backstory are pretty much answered—though I do have one more glaring question that hasn’t been pertaining to whether he is truly another famous Coluan friend of Kara’s. Either way, he is a welcome addition to the book, and I have to say that I’m enjoying the dynamic between him and Kara. Kara reconciling her memory with Krypton with the danger of the technology that her father unleashed is a powerful theme throughout the run that is again explored here. Kara’s desire to carry on the legacy of the House of El while addressing her family’s shortcomings is incredibly poignant. All in all, I thoroughly enjoyed this installment, and I’m very excited to see what happens next. Kara, Z’ndr, and Krypto enjoy a brief respite while the Circle closes in on them. Seems unlikely that Z’ndr is Brainy with amnesia or something, even though he is definitely being drawn and written to give off “Brainiac 5 vibes.” I mean, that “I…was five” quote? (Among many other turns of phrase and mannerisms that we’ve seen since he was introduced…) Seriously. LOL. I actually suspect he is filling a “Brainy-sized hole” in the same way that Laurel Gand was originally created to fill the “Supergirl-sized hole” in the 5YL and SW6 versions of the Legion. But with Doctor Manhattan *still* messing with timelines in the never-ending, eternally dragged out Doomsday Clock, who knows?